Passover is a community effort at Esther’s Place! 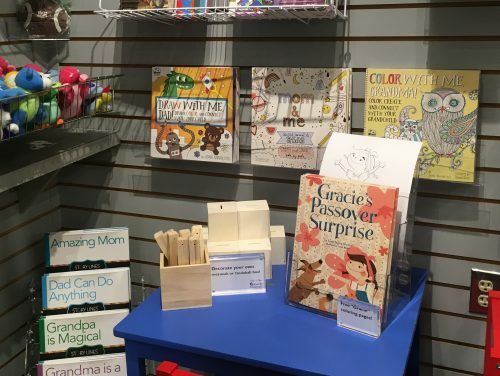 A blog post by JMM Office Manager and Shop Assistant Jessica Konigsberg. For more posts from Jessica, click HERE. 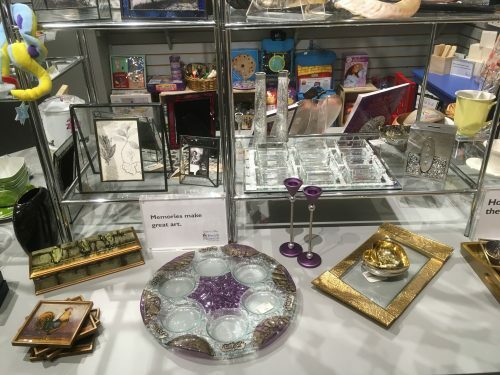 This year, Passover shopping has been going strong at JMM’s Esther’s Place since February, with visitors inquiring about gifts and Judaica well before Passover merchandise officially graced the Shop floor. Passover is the holiday that commemorates the liberation of the Jewish people from slavery in ancient Egypt and is celebrated this year from April 19 to April 27. 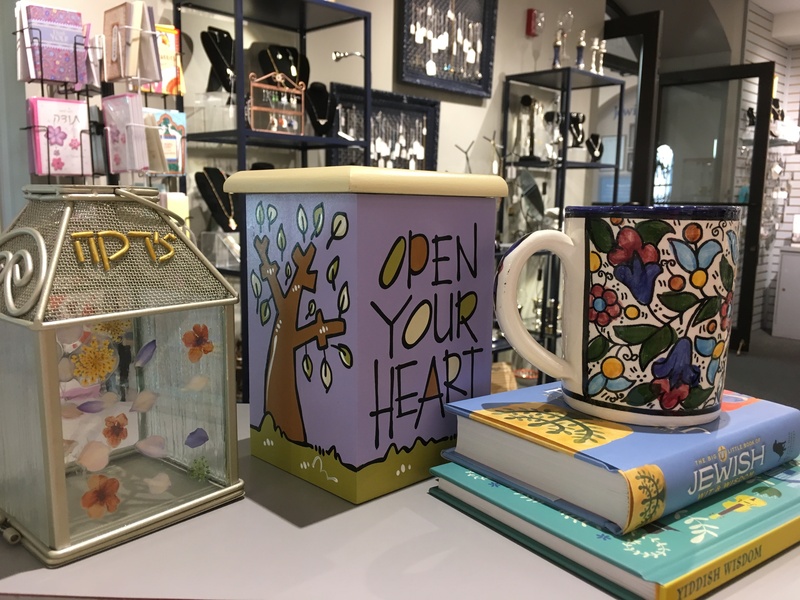 At Esther’s Place, helping visitors find the perfect gift (whether for a loved one, or themselves!) is one of our favorite things to do. Our staff and volunteers are passionate about engaging with visitors and figuring out exactly what each person needs and how we can help. Esther’s Place staff take note of special requests and feedback and make sure it informs our purchasing decisions year to year. Our efforts are the collective result of input and creativity from volunteers and staff, requests and ideas from visitors, and valued relationships with vendors old and new. Last year, we learned our visitors wanted more options for Haggadah (the Passover Seder text), particularly for younger readers. In response, we expanded our selection to appeal to a range of ages, Seder styles, and price points. Our selection this year includes the 30minute Seder (an affordable option with bright, engaging illustrations), My Very Own Haggadah (for younger readers), popular choice The (unofficial) Hogwarts Haggadah, and A Family Haggadah II: A Seder Service for All Ages. We also tried the Passover Haggadah Graphic Novel by Jordan B. Gorfinkel and Erez Zadok and have already sold the copies we ordered! We also received a call from an old vendor, Cookie & Nudge Books, with a recommendation to offer the new book Gracie’s Passover Surprise—a gorgeous, color-filled paperback about forging new traditions while honoring old ones. Don’t forget to grab a few Gracie and Max-themed coloring pages when you purchase your copy. In addition to helping visitors select Haggadot, it has been our pleasure to recommend Passover toys and games to inspire both fun and learning. And did you know that six of our popular “Macca Bean” soft toys are specialty themed to celebrate Passover? We have Muttzah, Gefilte, and Maroar to name a few. The beautiful thing about holiday shopping at Esther’s Place is that visitors need not feel restricted to holiday items. We have many meaningful products that capture the essence of a tradition or story. For example, we have many children’s books that speak to Passover themes of freedom, redemption, and beginnings. Thank you to a recent visitor for reminding me how widely our books’ themes can apply! Additionally, visitors can add creative flair to their Seder tables this Passover by exploring our tableware and finding the perfect bowl for horseradish or tray for matzo. Thank you to the Shop volunteers for helping me think creatively about what qualifies as Passover Judaica! Esther’s Place volunteers have made enormous contributions in celebrating Passover in the Shop this year from suggesting creative ways to merchandise tableware items, to re-imagining our children’s section to highlight imagination and fun, to helping every Seder plate put its best (figurative) foot forward and shine alongside complementary Kiddush cups, candlesticks, saltwater bowls and more. Thank you Rachel, Maxine, Seth, and Laraine! When visitors ask about or comment on our buying process I often tell them that we have “a lot of fun” doing it. This is true of course, but the real fun occurs when we have the chance to share the work with our community of visitors and benefit from their valuable feedback. When envisioning our 2019 Esther’s Place Purim celebration within the programming year ahead, it occurred to me that Purim (March 20 – 21 this year) is a celebration of identity and story—two themes that resonate across our upcoming exhibits and programs. 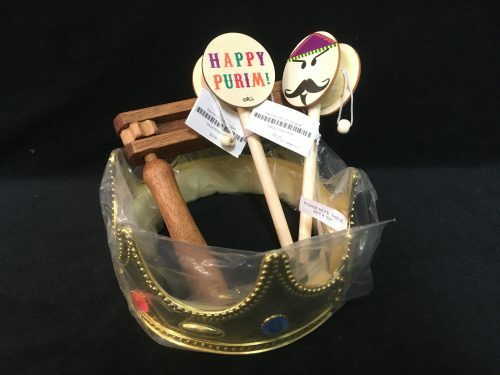 Last year, Purim was new to me so I wrote about our Esther’s Place noisemakers (or groggers), intended to drown out the name of villain Haman during the reading of the Book of Esther of Megillah. This year, I’m keen to learn about the creative, personal aspects of the holiday—the costumes, the lessons, the big themes—and how these fit into our work at JMM. Storytelling is an evergreen theme at JMM and Esther’s Place. 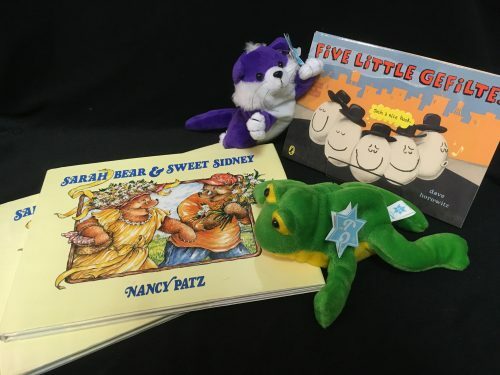 And March is National Reading Month—a fine time to stop by Esther’s Place Shop and explore our selection of engaging titles featuring characters ranging from the mischievous “Five Little Gefiltes” to the tenacious suffragists of Elaine Weiss’s The Woman’s Hour. Celebrate National Reading Month this March at Esther’s Place at JMM. Stories captivate our hearts and imaginations because they often contain struggles and triumphs, heroes and villains, honorable and wicked intentions, bravery, loyalty, secrecy, sacrifice, and difficult decisions. They can comfort and inspire, distract and entertain, and allow audiences to safely try on new ideas and identities. For young children, storytelling through dramatic play fosters understanding of the world and themselves. The Purim story takes place in ancient Persia where a Jewish woman named Esther is chosen against her will as Queen to the King Ahasuerus. Mordecai, a Jewish man who raised Esther, angers Ahasuerus’s Prime Minister Haman by refusing to bow before him, and Haman responds by plotting a violent revenge against the Jewish people. Esther bravely exposes her Jewish identity and successfully appeals to the King, saving her people. The Purim story abounds with concealed identities, dramatic revelations, and miracles disguised as ordinary events. And in keeping with the theme of hiding, children and adults often celebrate Purim by wearing costumes and concealing their identities as Esther did. Costumes offer new, temporary identities but still reveal truths about the wearer. In April, we’ll explore how we telegraph our identities through fashion and clothing with new exhibit Fashion Statement. What are some of your favorite Purim costumes from years past and what did they reveal (or hide) about you? I remember learning in elementary school that good stories typically feature a dramatic complication followed by a satisfying resolution. Purim seems to be a holiday celebrating this triumphant resolution. In reality, we might be at the beginning of a story, or perhaps in the middle—but once a year for those who observe, the chance comes to make noise; don new identities; and celebrate victory, diversity, and strong women (yes!). 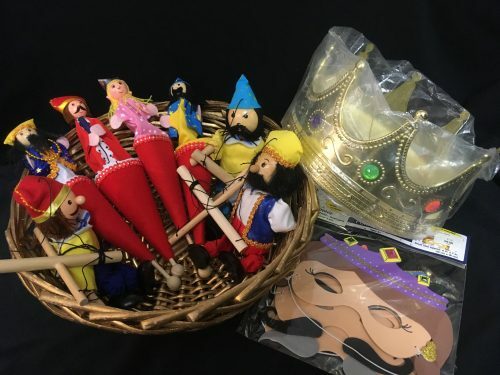 Here are just some of the fun items available at Esther’s Place this Purim, perfect for dramatizing the Purim story, and engaging the young Purim revelers in your lives. We offer numerous identity-inspired items that make excellent Purim host gifts. 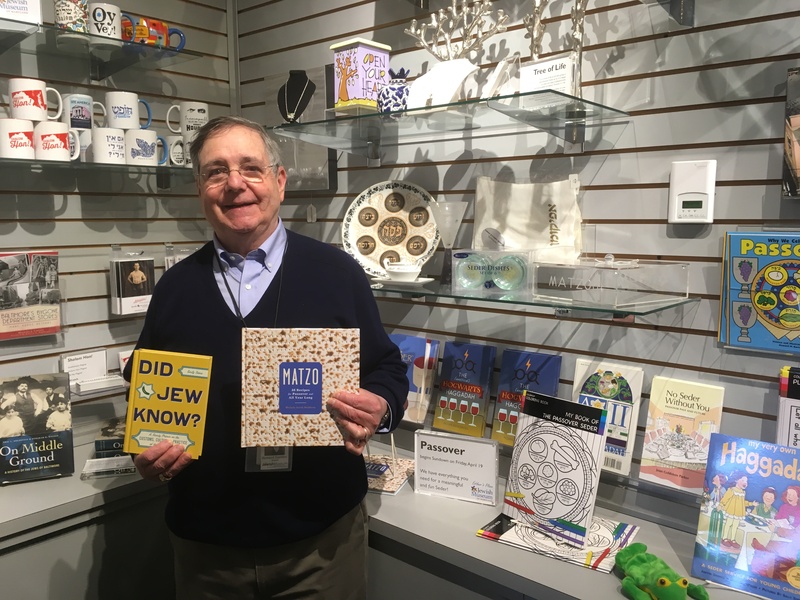 Celebrate a shared identity with our funny custom Jewish Baltimore souvenirs or delightful Mah-jongg products, including key rings with your favorite tiles! 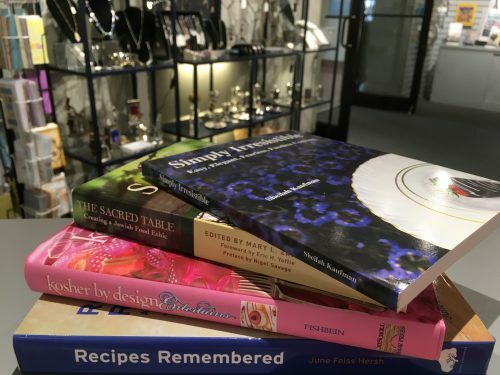 We also have a great selection of cookbooks and other thoughtful items to provide inspiration for Purim gift baskets. 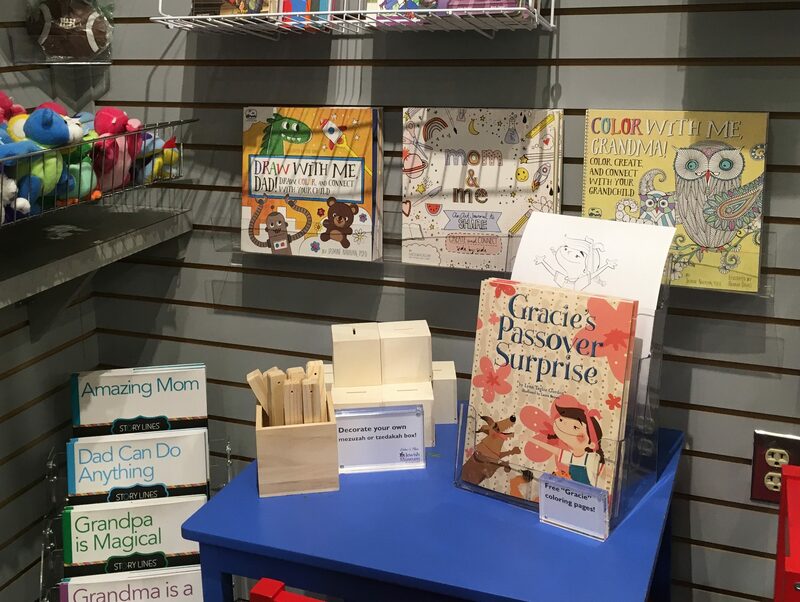 And our selection of children’s books and toys offer great inspiration for costumes! I wish all who celebrate Purim a joyful holiday that is also creative, inclusive, playful, and surprising. And make sure to stop by and ask our staff and volunteers for their National Reading Month recommendations this March! Almost exactly one year ago, I began work at the Jewish Museum of Maryland, helping to run the Gift Shop and support the hardworking Board of Trustees—as well as support visitor services, admin, and other Museum functions as needed. My first merchandising display and my first blog assignment celebrated Tu B’Shvat, the Jewish New Year for Trees. Tu B’Shvat marked for me not only the beginning of a new job, but a new world of learning about Jewish religion and culture. The past year saw me attend my first service (Rosh Hashanah at my husband’s family’s synagogue in Fairfax, Virginia), purchase a mezuzah (a Hanukkah gift for my husband), upgrade from a homemade paper Seder plate to a real one, and discover my own family connection to the B’nai Israel Synagogue building. 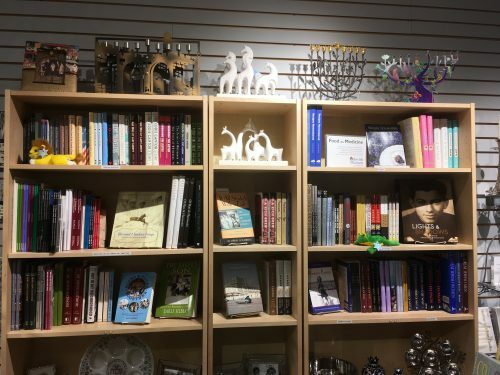 The year began with a simple display and blog post about Tu B’Shvat and ended with a lovely comment from my husband on Hanukkah: his favorite thing about me working at the Jewish Museum of Maryland is that we now share something new. I also had countless wonderful conversations with JMM visitors who taught (and continue to teach) me new things every day. I think my own internal JMM calendar will always begin with Tu B’Shvat—the beginning of my first Jewish year of learning. Using Tu B’Shvat to mark time is quite appropriate since the holiday, which falls on the 15th of the month Shevat, marks the opening of a new fruit-bearing cycle for trees in Israel. Tu B’Shvat celebrates both the literal tree and its fruit, and the tree as a metaphor for humanity. This month, in the lead up to Tu B’Shvat on January 20, Esther’s Place Shop will mark the holiday with displays celebrating the natural world and humanity’s connections to it. Since Tu B’Shvat 2019 marks the beginning of my second year at JMM, I tried to approach the holiday in a broader and deeper way by researching the Tu B’Shvat Seder, which typically involves consuming fruit and nuts in honor of the holiday’s lessons and discussing the connections between agriculture, seasonal change, and the human experience. 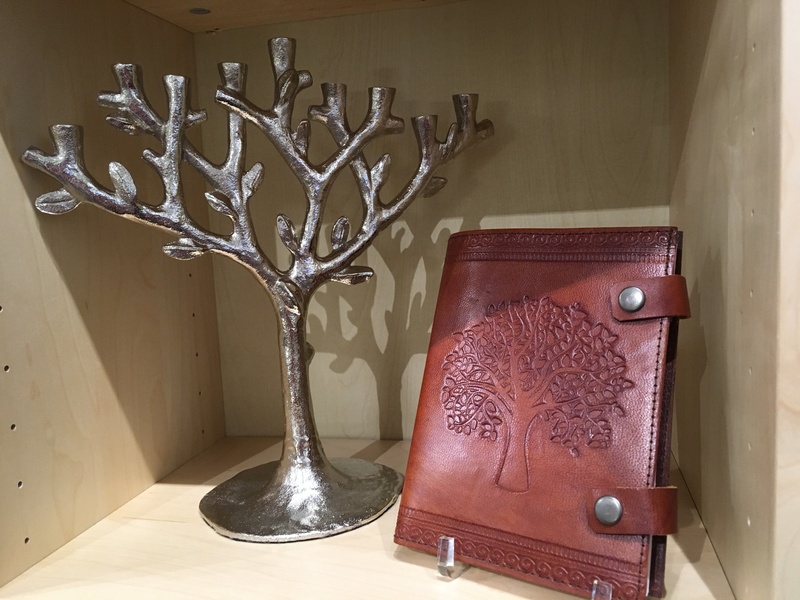 Last year, our display emphasized trees, but this year, in addition to featuring our beautiful Tree of Life products, I hope to think more broadly about the meaning of Tu B’Shvat and the metaphors of trees, fruits, and seasonal change in our lives. After reading a number of Tu B’Shvat Seder suggestions, I was inspired to think about Esther’s Place products that explore growth, productivity, possibilities, protection for the world we inhabit, and mystery and the pursuit of new knowledge. 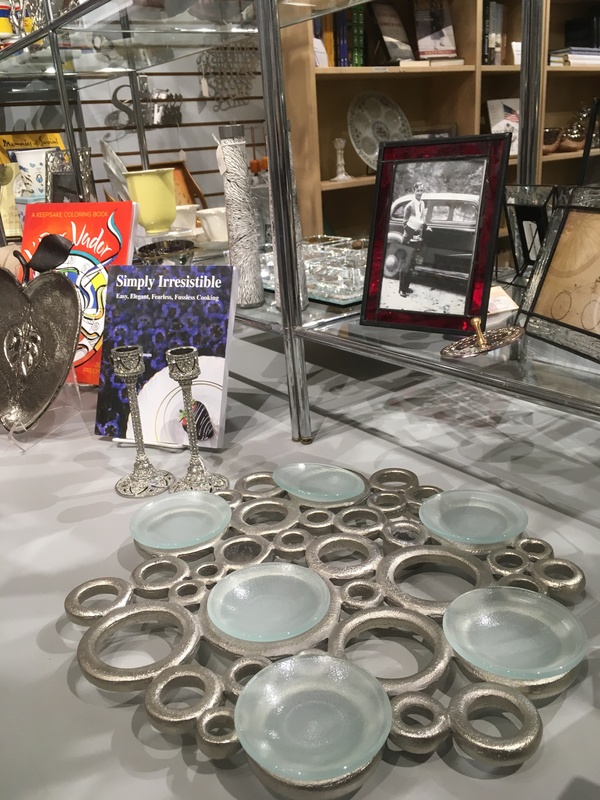 The display will include tableware and Judaica that honors the fruits of Tu B’Shvat and the beauty and possibilities of the natural world, like this Pomegranate Mini Pot by Michael Aram (left) and this Flower Blossom Bowl by Quest Collection (right). It will also feature new recipes for fruits and vegetables, essays about food ethics, nature-inspired wisdom, and nature-themed objects to inspire social justice goals. Vegetarian dishes are a popular choice for Tu B’Shvat dinner, and you’ll find many great options among our cookbooks. At Esther’s Place, many of our products ostensibly feature the natural world, but really at their core, they celebrate the interconnectedness of people and their environments. They are designed to be treasured and passed down, to spark conversation and reflection, to transform memories into art, and to infuse beauty into ritual—to name just a few. Tu B’Shvat is a special time to contemplate our relationships to nature, and for me personally, the beginning of a new cycle of Jewish learning and growth in my role at Esther’s Place. I look forward to what this New Year of Trees will bring at JMM, including new experiences, learning opportunities, and “fruitful” endeavors.